...Paulson, and Howard were part of a small cohort who showed foresight at a time when other investors were racing toward the cliff. And that's exactly what hedge funds are supposed to do. While regular mutual funds largely ride the market's ups and downs, hedge funds charge high fees (traditionally 2 percent a year, plus 20 percent of profit) on the promise that their managers can outsmart the faulty wisdom of crowds. But in the decade since the crisis, Einhorn, Paulson, and Howard have all, to varying degrees, lost their cachet, and their businesses are mere shadows of their former selves. They're hardly alone. The USD 3 trillion (!) hedge fund industry, less glamorous than it was during its heyday, is crowded with managers struggling to justify their costs. The problem with a business based on geniuses who can spot trends is that few remain geniuses forever. "Regression to the mean is a very powerful force in the universe," says University of Pennsylvania psychologist Philip Tetlock, who studies the track records of professional forecasters. "It’s harder for hedge funds to sustain high performance in the long term, especially when you have a lot of smart people second-guessing each other." Einhorn, Paulson, and Howard declined to comment through their spokespeople. Each unhappy hedge fund is unhappy in its own way. Einhorn's tale is one of a classic value investor, the dogged researcher who digs into companies hoping to find overlooked gems or, sometimes, overhyped trash. By 2008, he was already renowned as a bold stockpicker and a gadfly. He'd spent much of the 2000s taking to task a lender called Allied Capital over its accounting. He also shorted the stock-that is, bet on its price falling. He'd ultimately be proven right on Allied, as he was on Lehman, which he also shorted. Even so, 2008 proved a hard year for Einhorn. His Greenlight Capital lost about 23 percent as the rest of the portfolio was dragged down in the historic market slide. Then again, an investor in a sensible S&P 500 index fund lost 37%. Now Einhorn is struggling in a bull market. 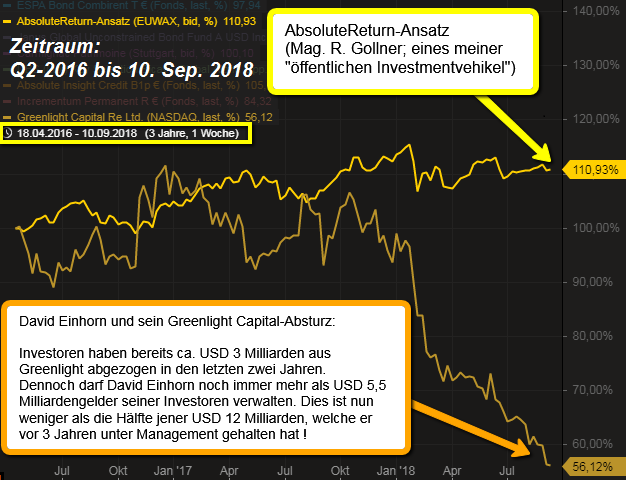 Greenlight has tumbled 25%this year (year 2018). Einhorn has been wrong-footed on nearly all of his top 40 holdings. He has bet on a crash in technology stocks, including Netflix and Amazon.com, that hasn't happened. Meanwhile, he's been long on Brighthouse Financial, which has tumbled 31% this year; General Motors, down 17% and German drug and chemical giant Bayer, which has slumped about 31%. He's also bet on gold, which has lost 8%. Einhorn told investors in July that it's been a frustrating environment for value investors. "Right now the market is telling us we are wrong, wrong, wrong about nearly everything," he wrote. "And yet, looking forward from today we think this portfolio makes a lot of sense." Investors pulled about USD 3 billion from Greenlight in the past two years, leaving it managing about USD 5.5 billion in assets, less than half the peak of USD 12 billion three years ago.